The Cayman Islands are world famous for legendary scuba diving. With more than 365 dive sites to choose from, warm water temperature and spectacular clarity, you could dive every day of the year! Recently awarded the WORLD’S TOP DIVING DESTINATION by ‘Diving’ magazine, the Cayman Islands have long been known for their crystal clear waters teeming with tropical fish and some of the most diverse marine life on the planet. So it won’t surprise you to know that it’s a Scuba Divers ‘Mecca’ in Grand Cayman, especially in East End where it’s still considered virgin territory. Some of the most sought-after dive sites in the world are right here – just minutes from the shoreline of Wyndham Reef Resort. 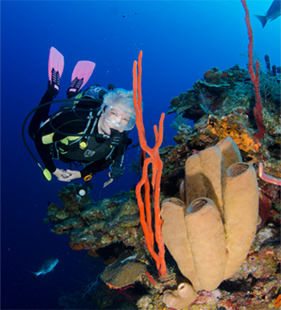 Ocean Frontiers is the leading and most awarded dive operator in the Cayman Islands with a world class reputation that spans decades. This is what they do and they do it better than anyone else in the business. Ocean Frontiers is the best because they are more passionate and dedicated to their customer than the competition. They would like their love of the ocean to be shared with the Wyndham Reef Resort’s guests and members through their unique snorkel and dive boat excursions. Experience Grand Cayman’s most natural beauty – under the sea! The resort course includes a 2-hour pool and theory session, and an afternoon 1-tank boat dive, which includes all scuba equipment and instruction. is a three-and-a half-day course designed to help students with the skills needed to become an Open Water Diver.